Weed, Dope, Grass, ganja, giggle weed, Aunt Mary, Mary Jane, chronic, rego, wacky tobacky, bud, grass, pot, herb, trees, greens, dope, indo, killaz, Smoke, dank, diggety dank, kush, cannabis. Whatever you want to call it, Weed is everywhere, especially in states with more liberal social policies. According to the National Institute on Drug Abuse, 99.8% of 12th-graders have tried Pot, with about 25% regular smokers. With California's upcoming September ballot, Pot might become more of a daily fixture in our lives. But that's the [possible] future, what about the past? Marijuana was first brought to the Americas by Christopher Colombus, but not for medicinal, spiritual, or recrational use, but in the textile form of Hemp. Hemp had, and still has, a variety of uses and can be grown in most climates, making it an ideal crop to help build a nation. Several colonies grew it and some even forced their members to grow Hemp by law. In the early 1900's, regulations on cannabis begin popping up in the eastern states, and California was actually the first to make cannabis illegal. The final blow came in 1932 when the Uniform Narcotic Drug Act (now part of the Uniform Controlled Substances Act) made cannabis illegal across the country. Several reasons are giving for the criminalization of cannabis, but anti-Mexican thinking was probably the real culprit. At the 1936 Geneva Trafficking Convention, many foreign did not want to include cannabis on the list of prohibited drugs, which led to the United States refusal to sign the treaty. Starting in the late 1930's, cannabis and, more specifically, hemp got a new enemy in the form of William Randolph Hearst and DuPont. Hearst was heavily invested in the timber industry and DuPont had patented a process for making paper and plastic from wood. Hemp was a cheap alternative to this process, and therefore would damage DuPont and Hearst financially. So they used their Washington connections (Andrew Mellon of the Mellon Bank was DuPont's chief financial backer and was also the Secretary of the Treasury under the Hoover administration) to help keep cannabis illegal. This continued until the 1970's, when states started to loosen the restrictions and allow more medicinal uses, while at the same time increasing the penalties for illegal usage (higher minimum sentencing and three strikes laws). States finally gained full control over the issue when President Obama stated that he would not prosecute people who are following state laws rather than federal with regards to medical marijuana. Whether you're pro legalization or con, be sure to get out and vote! Click here to register to vote if you're not already! 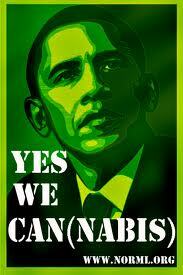 Also check out NORML for more cannabis info! Dave Attell gives his predictions about the legalization of weed in his latest Comedy Central Special.